Interior design can both be expensive and complicated, and there are several components to consider. An example would be the flooring elements that act as aesthetic materials. These elements add to the overall look of your home, and at the same time serve as a protective barrier for your flooring structure. No matter how big or small you feel your home space is, there are ways and means to enhance the look of your place through simple, ingenious means – that is, by employing methods that add an element of interest to your ceiling, walls or floors. But if you’re happy with everything except your flooring, then it’s time to go over flooring options, taking into consideration your budget requirements, as well as the pros and cons of each. This is easily one of the best time savers when it comes to flooring. Use a carpet to muffle noise in quiet areas, like your bedroom. Carpets tend to trap dirt and odor, so they require proper care and cleaning. The challenge is to find the most suitable carpet solution to meet the required contact performance. Delivering the optimal solution requires a clear definition and understanding of key traffic areas within a home, in order to source the right products that will withstand expected wear and tear. This material is considered all “easy” — that is, easy to install and clean and pay for because it is relatively inexpensive. However, vinyl also needs to be replaced from time to time because of wear and tear. Moisture left underneath during application can lead to mold and mildew, so it must be applied properly. This type of material is best for use in kitchens and bathrooms. Considered one of the most expensive options, well-maintained hardwood flooring can literally last a lifetime. Engineered options wear well even with changes in moisture. However, hardwood requires expert installation so that you don’t get left with any creaks and signs of buckling and crowning. It is best used for most areas in the house except the bathroom and laundry room and other high-moisture areas. Generally resistant to scratches, tears and similar damage because of its durable melamine plastic wear layer, laminate wood flooring does not fade in the sunlight like hardwood flooring, and is also cheaper. Naturally resistant to the growth of mold and bacteria, laminate flooring is generally easy to clean and maintain, requiring only sweeping or vacuuming to remove dirt and grit. An eco-friendly option that is affordable, easy to maintain and install, linoleum may need periodic replacement due to wear and tear. It is highly recommended for busy areas where the possibility of spills are high, such as the kitchen and dining room. This is another “green” option (the non-synthetic variety) made from the rubber tree, although somewhat expensive. Rubber is tough, durable, good for noise insulation and vibration reduction, and is resistant to cigarette burns and fire. Watch out for abrasives like detergent as well as grease stains that can damage your rubber floor. 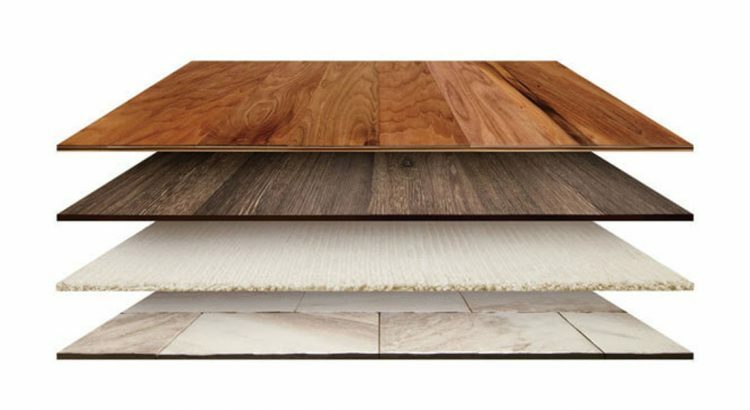 This type of flooring may come in ceramic or porcelain material. Although tile flooring is durable, versatile, easy to clean and maintain, and has a number of aesthetic applications, its hard quality and type of surface makes it unsuitable for certain sections of the house. Since it is suitable for high humidity environments, tile flooring works well if used in bathrooms and kitchens. Extremely durable and resilient, concrete flooring is difficult to damage even when you walk around in heels all day, or if you have pets that will try to scratch on its surface. Also relatively low maintenance, concrete flooring only requires periodic waxing to maintain the protective layer on its surface. Some drawbacks of concrete floors include its hardness, which makes accidental falls painful and even dangerous. It also does not retain heat very well, which can be a disadvantage during cold weather, and it can be uncomfortable to stand or sit on for long periods. Other flooring options you may want to consider depending on your design requirements and budget include bamboo, cork and natural stone.